Connecting to our beauty is the greatest gift we have to offer ourselves, each other, and the world. Yet, shifting from self-criticism to self-compassion is one of the most challenging and transformative journeys a woman can make. 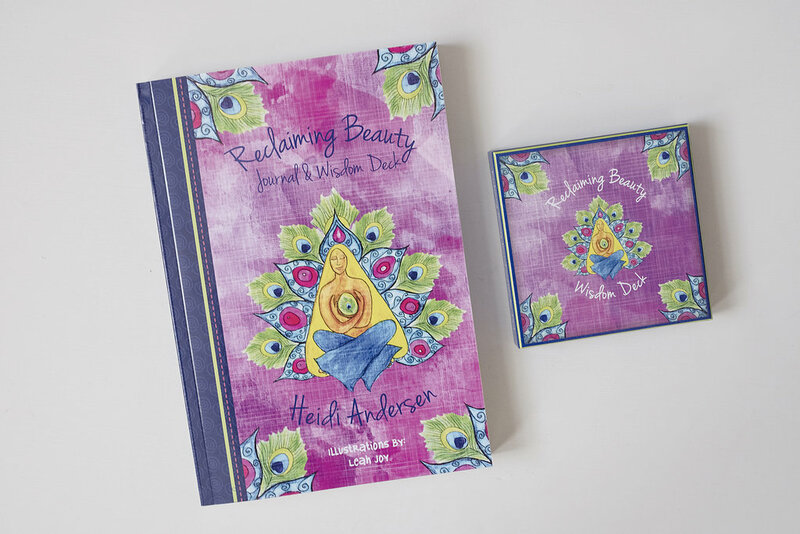 The Reclaiming Beauty Journal and Wisdom Deck is a beautiful, inviting, and inspiring aid for all women willing to step on this Reclaiming Beauty path. This unique resource includes an elegant journal and a corresponding deck of colorfully artistic cards, each with an affirmation about beauty and self-love. Also included are engaging ideas for exploring these affirmations, such as writing reflections, making collages, practicing yoga, meditating on memories, and creating healing rituals. Suggestions for its use include working through the cards in order, alone or with a circle of friends, at one’s own pace or throughout a year, or drawing cards at random for inspiration or an intuitive reading. The Reclaiming Beauty philosophy approaches body image as an externalized reflection of how we feel about ourselves: body image mirrors self-image. Negative body image suggests internal obstacles to self-acceptance that need to be addressed. Readers will find resources for healing shame-based identity, embracing their unique beauty, and developing an action plan to offer their unique strengths and gifts in service to the world. The intention is to inspire women of all types, ages, sizes, and shapes to heed the call to their personal Reclaiming Beauty walk and courageously step forward on their journey. Heidi Andersen, MS, LPC, CEDS-S, RYT, is a Licensed Professional Counselor and a Certified Eating Disorder Specialist, with special interests in Embodiment and Body Image. During her career, she has worked as a therapist in residential treatments centers with both middle school girls and women suffering from eating disorders. She currently maintains an outpatient private practice and offers psychotherapy groups and workshops for women and girls struggling with food and body concerns. With a strong belief in the Body-Mind-Soul connection and the importance of spirituality in the healing process, Heidi holds the vision that all people will learn to see the beauty in themselves and those around them.